Moulage arose during the Renaissance and was perfected in the 18th century when it was practiced extensively in Germany and Italy. Wax allowed for a versatility and realism unattainable through harder media. Medical moulage occurred here in Kingston during World War II due to the efforts of Dr. Edwin Robertson, Chairman of the Department of Obstetrics and Gynecology at Queen's University. Robertson had a keen interest in medical education but was frustrated by the scarcity of anatomical specimens. He found an able collaborator in Marjorie Winslow, a Kingston artist. Winslow began by observing Roberton's patients in the clinic and operating room and because she was not allowed to sketch in these settings, she sculpted a preliminary clay model from memory. The technique was threefold: a clay model was first sculpted and then used to make a plaster cast. Molten wax was then poured into the cast, allowed to set and then removed. Lastly, fine details and colour were added to achieve a precise and life-like representation. 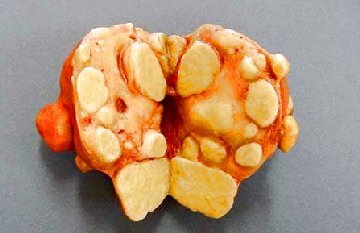 An enlarged uterus with two intrmural fibroids. Two small fibroids are visable on the surface as well. Uterus with fibroids and an ovarian cyst. Depicts a grossly distorted uterus - likely with multiple fibroids - and a large ovarian cyst. The uterine tube and ovary are normal on one side. The other side shows the uterine tube stretched over a large ovarian cystic lesion. Congested blood vessels can be seen on the surface and the spots indicate some hemorrhage. A split uterus with multiple large intramural and subserous fibroids. A uterine (fallopian) tube can be seen on one side. Fibroid - A tumor composed mainly of fibrous or fully developed connective tissue. 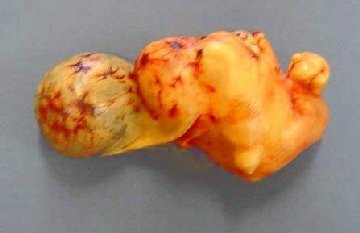 A benign tumor derived from smooth muscle, most commonly of the uterus. 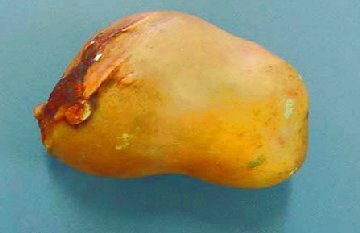 Cyst - Any closed cavity or sac, normal or adnormal, lined by epithelium and especially one that contains a liquid or semisolid material.